Getting declined for credit isn’t fun. Getting approved with extremely high interest rates isn’t any better. Being haunted by poor credit decisions in your past is the worst. It’s time to stop being held back from living a life you deserve. Good credit will help get you there. We give you more than just an improved credit score. We give you the tools you need to fight for your rights. Thousands of lives changed through ReCredit. Millions of dollars in interest saved. Second chances made possible for everyone. I honestly cannot believe the work ReCredit has been doing for me. I spoke with Lyann and she put a plan together, and it worked better than I could ever imagine. When I saw these results, I almost wanted to cry! My credit score has gone up 202 points in 11 days!! This has been the most amazing experience! My credit history show from non-existent to a 776... It was great working with such an amazing team. I have no reservations whatsoever in recommending them to everyone I know. I can't begin to express my gratitude toward ReCredit. I've been in a battle with my credit score for years due to economic downturn of the real estate crash in 2009. 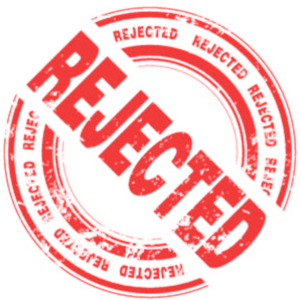 I've paid for many different credit service companies who promised they would help my situation, and all I was given was false hope. Then I found ReCredit and everything changed! My score was in the low 600s and within 60 days, my score went to 800! Lyann worked with me hand-in-hand until I reach my credit score goals! THANK YOU so much for your time and patience – teaching me to help people in need of better credit. I am now a bulletproof expert and can help other people! I want to thank you and the ReCredit team for helping me get my FIRST credit card! I came from Mexico 10 years ago and am currently living with my wife and 2 children in Chicago. We were so blessed to meet an angel who introduced us to you! We are getting our finances in order and building our credit score up so that we can make our dream come true... buying a new home! 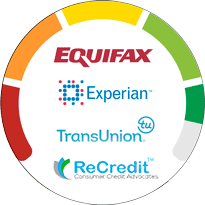 ReCredit analyzes your credit reports and guides you through the process of getting any negative, unnecessary, inaccurate and unauthorized information deleted/removed from your three major credit reports which are Experian, TransUnion and Equifax. We provide a comprehensive written plan to achieve your credit and/or debt-related goals based on our in-depth analysis. Most Members will see improvement/positive results within 45-60 days. The average person will complete the process in less than 12 months. More complicated credit situations may take longer to resolve. Our members have 24/7 online access to their progress via multiple sources including free monitoring sites and our interactive software system. Items we help people with include collections (from credit cards, medical bills, utility bills, cell phone bills, auto-loans, etc.) charge-offs, public records (judgments, tax liens, etc. ), foreclosures, bankruptcies, student loans (held by private companies), late payments, and inquiries. Please note: not all items may be eligible for immediate removal/deletion. This is a general statement. Most agencies and people who do not work in this profession are led to believe that items will remain on credit reports for up to seven to ten years. This is true if you don’t do anything about the items. We work to speed up the process and get your reports and scores in good standing. We guide you in the process of getting the items removed/deleted quickly by using the Federal consumer protection laws. Get started with us today! 6When am I charged for services? We will collect your payment information up front, but you are not charged until the beginning of your second month of membership (32nd day following enrollment), after initial services are rendered. This includes your consultation, access to our exclusive knowledge base, and/or dispute actions / (letter(s) are generated for you. If you would like to learn more, please read and review the disclosure statement here.